Alessio Nebbia was a designer, photographer, illustrator of mountains, sculptor, but primarily he was a lover of mountains. In particular he loved the mountains of Valle d'Aosta as evidenced by his model of the Aosta Valley which required three years of work, from 1954 to 1957, and the use of thousands of photographs. The model is currently exhibited in the lobby of the Regional Council of the Valle d'Aosta. Alessio Nebbia was born in 1896 in Castello d’Annone, near Asti, Italy. Few years later he moved with his family to Turin, where he spent his childhood and his youth. In Turin he developed an interest in painting: museums, painting exhibitions and always nature was his guide. The need for loneliness and the love of mountains that he nurtured since his youth took him in 1925 to the mountainous region of Courmayeur. The spirituality and the bounty of nature in Courmayeur had a decisive role to play in the formation of his artistic career. He started illustrating the landscape through a series of wonderful paintings which has considerable historical value now. 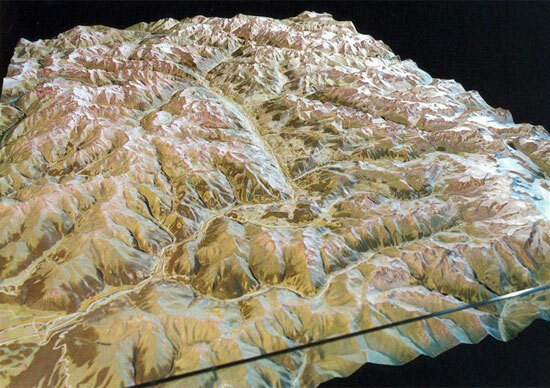 At the same time he diligently worked on representing the mountains through maps and plastic models perfectly in scale. In the years following World War II he developed an artistic vision of the mountains. This resulted in several paintings illustrating the deeper and more intimate aspects of the mountainous terrain such as snowfalls, dawns, sunsets or nocturnal scenes. In this phase Alessio Nebbia alternated between Turin and the Aosta Valley. In 1972 he moved to Cuneo, Italy, where he died on October 18th, 1975 . Audisio, Aldo. Alessio Nebbia tra geoplastigrafia e pittura. Museo Nazionale della Montagna Duca degli Abruzzi, Club Alpino Italiano, Sezione di Torino, 1982, p.58.